Valerie: We are calling upon Cosmic Sai Baba – it is Tuesday, the 7th of February 2017, and we call with love and respect to make His presence. ❝I am here, and I am very pleased to be here. 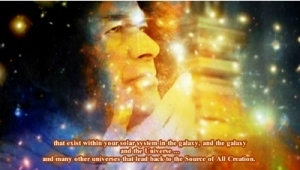 It is Cosmic Sai Baba you know me well and I know you – and I am very happy to be here as I have said. There is a lot of happening upon this Earth – and you are aware there has already been talk about the suffering that your planet Earth is going through. It is obvious that there is a problem with your Earth. And it can be assisted – the star people are willing to help you and things could be healed quite quickly if you were open to listening to what they have to offer or advise. But they will not give this information out until everybody is aware and ready to accept … … (pause) – how can I say – accept the consciousness that comes with the information and also abide by the Laws of the Universe. This is important and so we would not give the information readily until we know that you can be trusted to use it properly and with respect to the Source of all Creation. Otherwise, it would be like giving a box of matches to children to play with and this would not be good … it would not be good for anybody. And so my message today is rather short. I come because I want you to know that I love you all and you are in my heart. You come from the Source of all Creation and that is the universal love. It is not limited in any way – it is always there – and it is within you so that you can use it, and spread it and share it to people that are in trouble. You just call upon that aspect of yourself (God) and from the Source of All – so that is joined together – and then you can impart it to whoever you want to assist. It is very important – and it is the intent that is important – because then the energies will flow like a river – a beautiful river, that white sparkling water you could see it like that; or you could see it like a mill pond – very calm and peaceful – and all these things are available to you – all of you – to decide that you want peace upon this Earth and healing for your planet Earth. This is the message that has been going out – We have – can I say feed or fed thoughts to many people – about the things that are going wrong with your planet at this time – there is a need to take it seriously. It is not necessarily called “Climate Change” or “Warming” or “Cooling” – all that is happening – there is a problem with your planet and you need to fix it. So with that – I will leave you but … I do not want to frighten you, I just want to encourage people to take the matter seriously.